1. 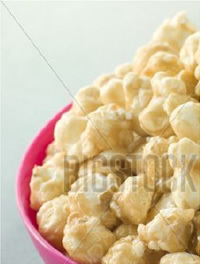 Heat the oil in a large saucepan, sprinkle in the popcorn and swirl the pan to coat the popcorn evenly in oil. Cover with a tight-fitting lid; turn the heat down to low and listen out for the popping to begin! Once the popping quietens down, take the pan off the heat. 2. Meanwhile, melt the butter, add the brown sugar and golden syrup and stir over a high heat for 1-2 minutes. 3. Pour the toffee over the popcorn, replace the lid on the pan and shake to mix the toffee sauce. Pour out into bowls, allow it to cool a little then bon appétit!